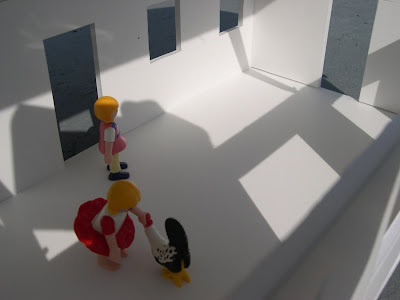 Ayumi Horie has a great page-o-links. I'm not just saying that as some sort of blog-o-sphere payola scheme. It's really nicely done. Also see her photo diary of Japan here. Here is just one of the many great views that Ayumi captured on her trip. Over the last few weeks I have been reporting on the goings on around the "neighborhood". It's been fun and I've enjoyed seeing what people were up to. It's a great neighborhood and I'm so lucky to be part of it. 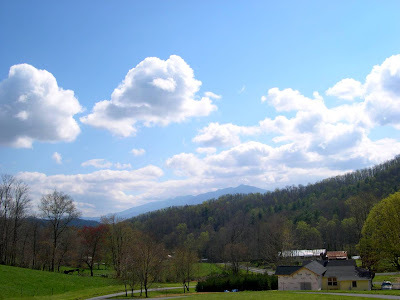 When I'm on the road and tell people that I live down the road from the Penland School, the most common thing people say is how lucky I am. It's true and it's part of the reason I decided to stick around like so many resident artists at Penland have done over the years. 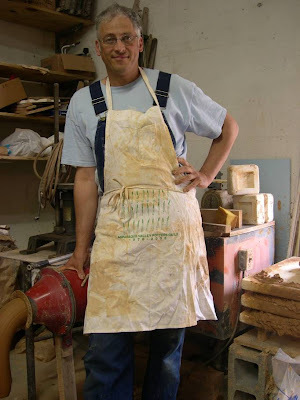 Well today I saw Josh Copus who has been assisting the Dalglish/Hunt/Stuempfle workshop upstairs at Penland. 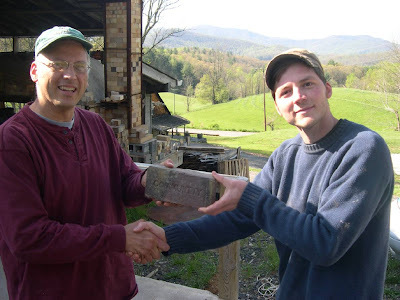 Here, in a very low key event, I am presented with a "community" brick made by Josh for his thesis show at UNCA a couple of years ago. I'm honored. It's a pretty nice brick. It's been great to see Josh and visit the class from time to time. Time flies and no matter how long eight weeks may seem to be at the beginning of a concentration at Penland, it always flies by. I wish I could have visited more often, but like I have said before, life gets in the way. We'll say goodbye in a couple of days and they will be missed, but they will always be part of the greater Penland community. 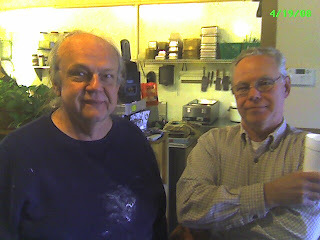 I had a nice breakfast with fellow potter and neighbor Terry Gess and enjoyed some chicory coffee and apple fritters, yum. 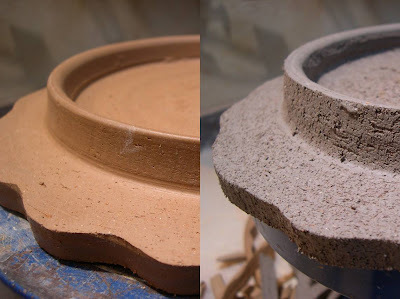 Then I took these pictures for Lyndsey who inquired about processing local clay. They are shots of the drying racks without sheets and slip and with slip drying in the brilliant sunshine today. I've mixed up about 800 lbs of dirt in the last week or so. Here we see my pots set up as farm stand for the masses to come and buy them, priced and ready to go. Then it was off to the shop to cut feet on some plates. The sandy plate was a bit harder to smooth the foot ring as I did on the left. The rims of these plates are cut with a cheese cutter (free hand/eyeballed). If I used the clay with sand I would have to have a lot of spare cutting tools since the sand was grinding away at the metal pretty substantially. But I like the feel of this mud quite a bit. Maybe I will do some tests with less sand. The sand is from the feldspar company and has a bit of spar in it I suppose. Saturday was a busy day for me. 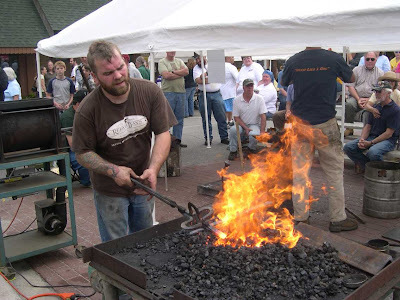 In the morning I took my daughters over to Spruce Pine for the annual "Fire On The Mountain" Blacksmith Festival. Here is my neighbor Andy Dohner putting the heat to the iron during he and Zack Noble's forge welding demo. looks like Zack better get out of the way of that flame...It was a beautiful spring day and there were a lot of folks dowtown to see the blacksmiths do their thing. There were blacksmiths from all over the Southeast in attendence. 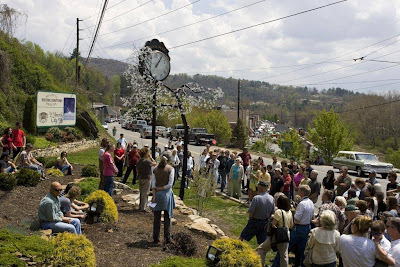 Unfortunately, for me, I missed the dedication of the new sculpture by Elizabeth Brim that was installed at the new clock on Upper St. Elazabeth created a full scale sculpture of a Sarvisberry tree to wrap around the clock. Here is a picture of Elizabeth and the work in process. I'll try to get a picture posted of the completed piece. After I left the Blacksmith Festival I headed over to Seagrove, NC and the North Carolina Pottery Center. It was the day of their annual benefit auction to which I had donated a piece. According to some of the folks there the attendance was down quite. There were some delicious snacks and plenty of refreshment for the public and the potters in attendance. It was great to look and pick up the pottery that was on display. 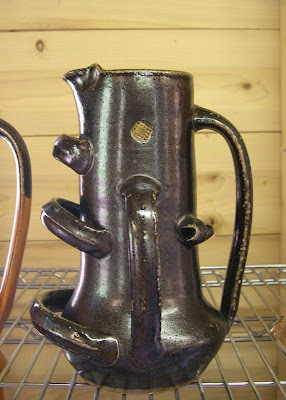 There were contemporary as well as historical pottery that had been donated by potters and collectors respectfully. I wanted to get more pictures of those in attendance but got caught up in conversations with my "potter-cousins" and failed in my mission as a "poterrazzi". I did get these pictures of some curious pots that my friends Bruce Gohlson and Samantha Henneke picked up for a pittance. We thought they were probably from Spain. 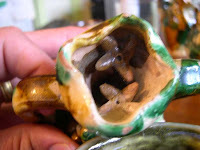 I had seen a similar glaze treatment on a piece that Tom Spleth bought in Spain while he was vacationing but the press molded shells and other additions were different. In the blurry detail above you may be able to see that it has a curious perforated neck with some flower shaped additions in side the neck. That was something I had never seen. Samantha thought that the body of the pot was thrown as a closed form and the neck was thrown onto the body. Interesting pot with no clear reason as to why it was made this way. Has anyone seen anything like this? Please comment if you have. I had a great visit with all my Seagrove "cousins" at the after party at David Steumpfle and Nancy Gottovi's house. I stayed with Bruce and Samantha and I had a great visit on Sunday looking at their pots in their cupboard and their show room. Here are a couple of their fine pots. Unfortunately I had to leave and they had to get some work done, so I shooed myself off to the mountains. 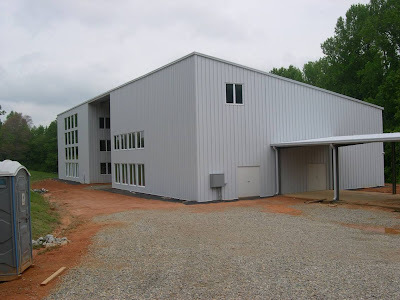 I snapped a picture of Bruce and Samantha's new home and studio that's still under construction. 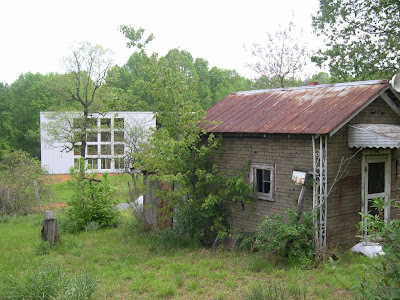 The little shack in the foreground is an old canning kitchen that served as their first studio after they had moved to the Seagrove area in 2000. I will look forward to visiting again after the new place is finished. It's an awesome space that they've been working on since last August. Maybe we'll see it in Dwell magazine! 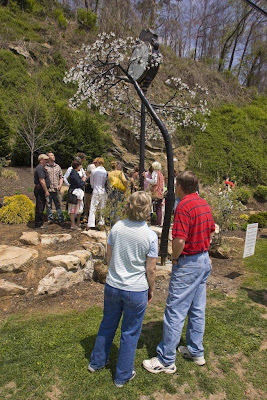 If you're in the area check out the show which opens on Saturday in Bakersville, NC. Reception begins at 6pm. For more info call 828-688-3599. Go to Crimson Laurel web site here. 25. go to pot, to become ruined; deteriorate: "With no one to care for it, the lovely old garden went to pot." An item which is broken, defective or substandard. Two explainations have been historically applied. The first is that in olden times when food was scarce, people would leave the bones, fat and undesireable portions behind after eating their meal. These second-rate items would be used for soup the next day, so as such, the poor-quality leftovers would "go to pot". The second (and more plausible) explaination is that in the days of the industrial revolution and early mass-production, assembly workers would occasionally find a defective or out-of-tolerance part which was not suitable for use. This part would be sent back to the smelting room to be melted down and re-cast a second time. Since the smelting was done in a giant pot, these defective parts had "gone to pot". In either case, the phrase gained popular use by the American homeowner who would occasionally wear out an item which would fail- often at an inconvenient time. Frank didn't want to take his car in for routine maintenance. I wasn't surprised when his vacation was ruined after the car went to pot last summer. Maybe we should call it sweetening the pot instead. I digress. 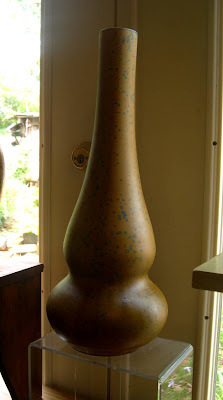 The Ninth Annual NC Pottery Center Benefit Auction is this Saturday! 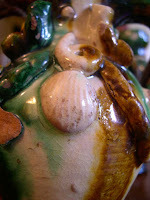 I have been donating pots to the auction almost every year. I kind of missed my chance last year somehow. These things happen. I love taking the trip over to Seagrove. Here is a nice online preview of Saturday's auction. I hope to see some of you there. Come and support our NC Pottery Center. I wanted to post this picture of Linda in yesterday's post but just now found it. Taken by Asheville photographer Michael Mauney for the Highwater Clays catalog cover. Today was another beautiful day here in the mountains. The kind of day that I dread going into the old mushroom factory studio. So I putzed around the house doing little projects like taking a broken storm window out of the girls bedroom, feeding the chickens, doing a load of laundry, making a mid morning snack for the girls, you get the picture. Anyway, after a string of phone calls I drive over to the studio. It's really not that bad this time of the year. I can open the big sliding door to the outside, the breeze is nice. The sun was pouring through the skylight. So off I go to make some plates. And make plates I did. Then the ultimate distraction. 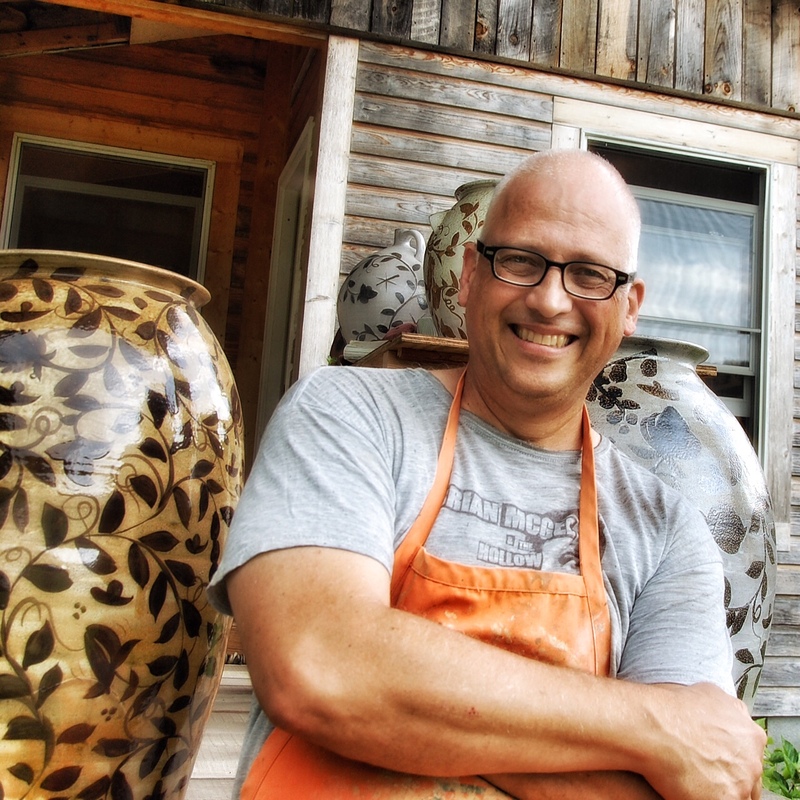 My friend Shane is unloading a kiln at Linda McFarling's just over the hill and down the road. 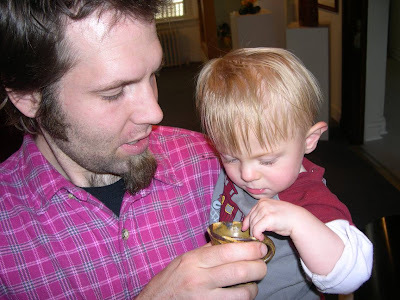 What a great reason to drop what I'm doing and visit with some potters. 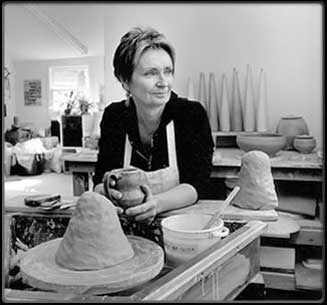 It was a great visit, with one kiln unloaded and another loaded and started with Joy Tanner's pots. Shane was trying to fix a problem with the burners which were sputtering a bit, Roan Mountain potter, Will Baker looks on. There were tools everywhere, and of course I had to throw my two cents worth in. 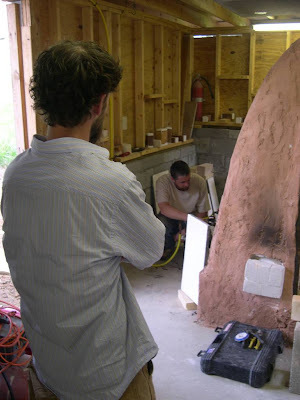 Here is Shane standing next to the soda kiln he built for Linda. The spy bricks are for spraying the soda into the cross draft gas kiln. 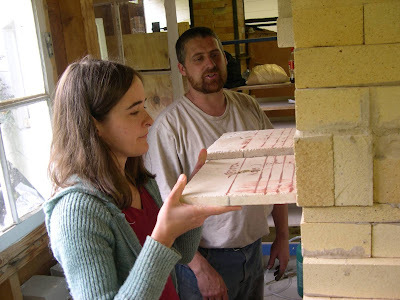 Here is a picture of Shane and Red Hill, NC potter, Joy Tanner adjusting the dampers. Anyway, Linda and I had a great conversation as always about pots, teaching, making marks with brushes. 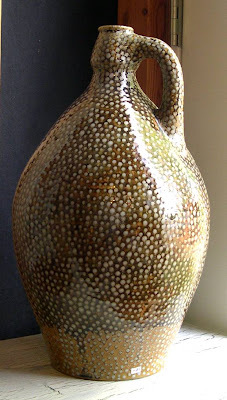 Linda's pots are some of the best anywhere and I was really loving the brushwork she does. 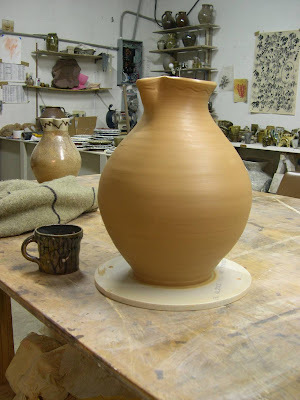 Here is a pot, though without applied decoration has plenty going on with its surface. I love this form which I think has a basket-like quality. It's always a pleasure visiting Linda and we always exchange a lot of ideas when we do. I was reminded by this gathering of potters and neighbors how special this community is. 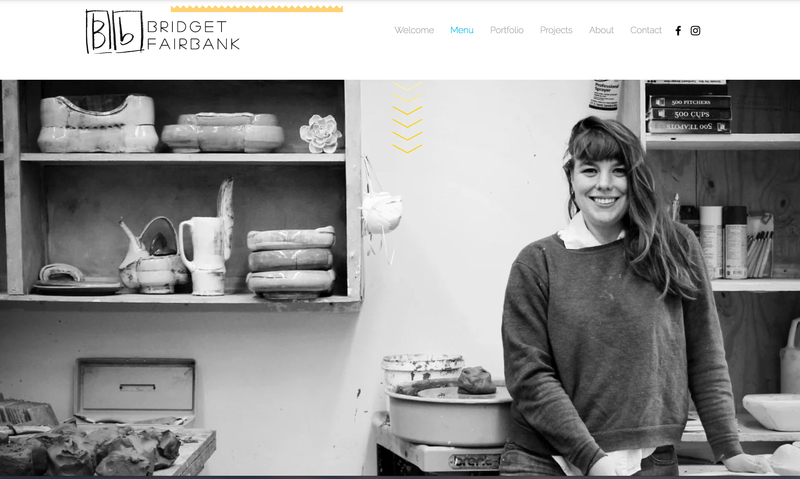 Not only in the friendships but the inspiration I get from all these exciting potters. I thought that I would show a picture of the plates I threw today. I don't throw these plates as much a smash them with the wheel spinning. It is a form I made a lot of after my accident a couple of years ago. 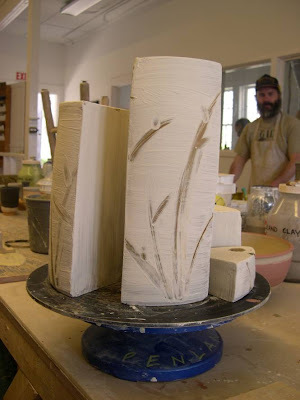 With really soft clay I use the side of my palm to form the very slight curve. I then scrape and rib to get a real smooth surface to paint. It's a nice form to decorate. And with just the right camera angle makes me feel good about today's output. By the way here is my eight pounder with handle. It will be about a gallon and a half when fired. 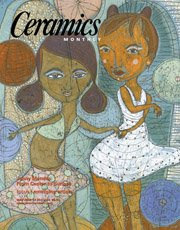 Jenny Mendes on the cover of CM! Way to go. Also a nice cover story by Katey Schultz. Check it out here. 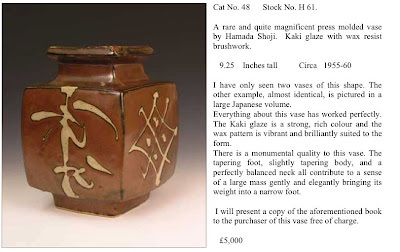 Phil Rogers will be hosting a selling exhibition of Shoji Hamada's pottery April 26th - May 3rd. There is a beautiful catalog that you can download here. Here is a really nice bottle with a description from the catalog by Phil Rogers. 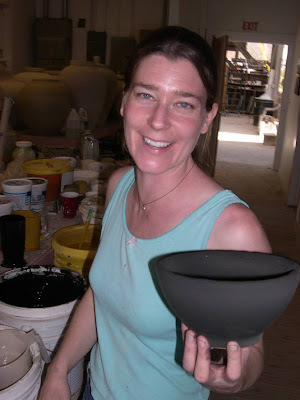 Just a quick plug for my friend Julia Galloway who has a vast show of her new pots at the Harvey Meadows Gallery in Aspen, CO. It's a tremendous survey of birds of all kinds on cups, ewers, and pitchers. 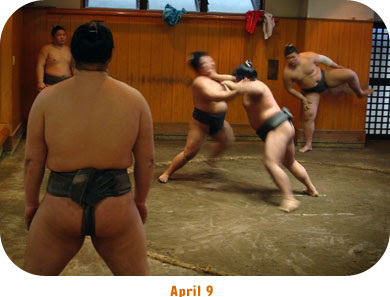 The website has much of the show online here. Nice job Julia (and Sam and Alleghany, for putting it up for all of us here on the east coast to get a look). After waking up I had to go over to the studio to finish my eight pounder still spinning slowly on the old Shimpo. After a couple of yanks it was done. I guess it wasn't the most productive day at the wheel, but at least I'm started and have the clay pugged. 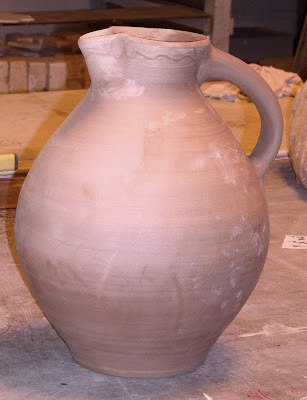 Some of the pots I want to make this session are jugs, pitchers, bottles, and platters. I haven't made a lot of these lately. Also I'm making some more pachyderm teapots; after the last round I want to try some new things. I have a show with my bud Jenny Mendes in Iowa City in July and want to make some special things for that show. Yeah, yeah, Talk talk talk. Check back soon. Well I got back to the real work today, pugging clay and making pots. 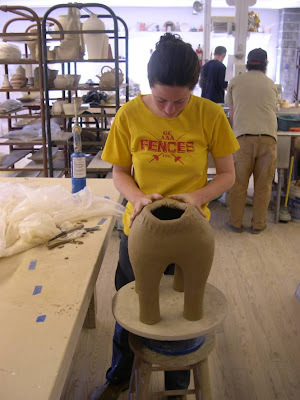 Here is a picture for my alma mater pottery guild up in Massachusetts, The Asparagus Valley Pottery Guild. Angela Fina gave this apron to me last year in Louisville, when we were at NCECA. They are having their studio tour up there this coming weekend. If you're in New England, specifically western Mass. check out these wonderful friends of mine. Here is a link to their map and info. I started my throwing today with some 8lb. 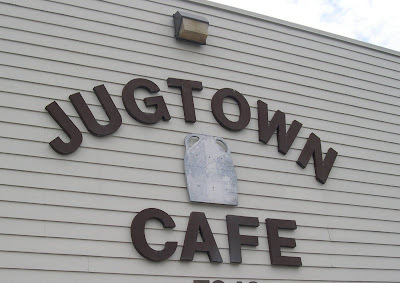 jugs on his suggestion. It wasn't bad. Film at 11. 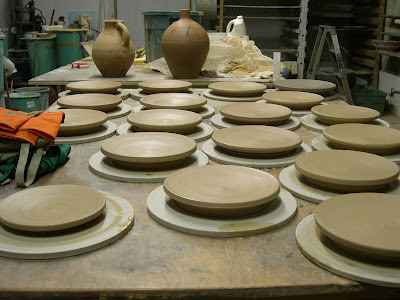 I guess until I get a lot of clay spinning off the wheel, hopefully tommorrow, I'll just roam around and visit potters actually doing something. It's been gorgeous, weather wise, so it's been nice to get around these hills. Just went over the hill to visit my neighbor, Steve White of the Rebel's Creek part of Bakersville. It was a breathtaking view of the Black Mtns. from Steve's place. Steve is a doctor-turned-potter, or I guess you could say a clay turning doctor. Steve just did a couple soda firings, back to back and had some pretty nice pots. 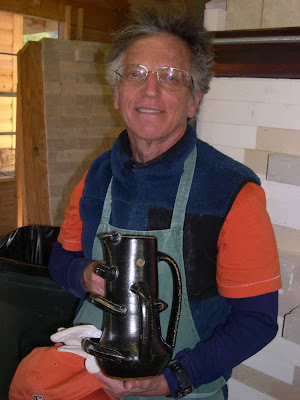 Here is Steve with his soon to be famous multi- handled pitcher. He said it was sort of a handle sampler or handle fetish object. I thought it was pretty interesting and it fired pretty handsomely. Aside from the usual problems we potters have out of every kiln load, the firings seemed very successful. I told Steve about the Salt/Soda potter network and a current discussion about adding whiting(calcium carbonate)to the soda mixture. It's been interesting to follow. 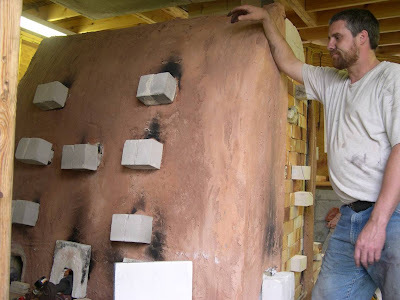 Shane Mickey designed and built Steve's soda kiln. 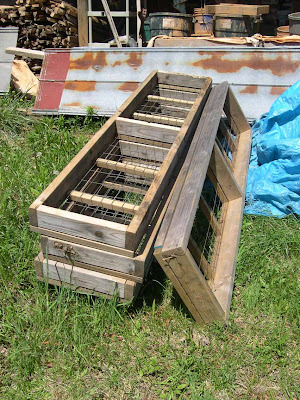 He also built this nifty door brick rack. 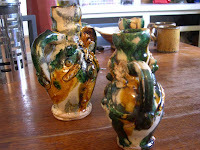 Steve had a great collection of pitchers on his mantle as well as a very fine jar by NC potter Daniel Johnston. 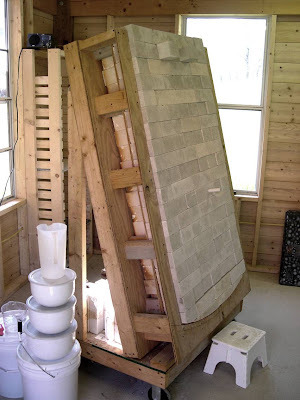 I failed to get a picture of those or of the soda kiln that was the subject of this post. What kind of reporter am I anyway? I better stick to pots. 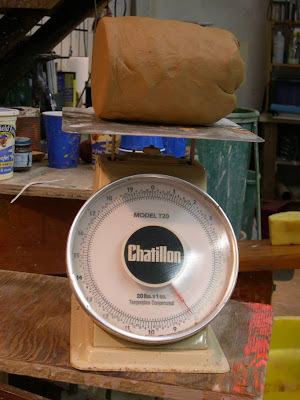 I have a giant pile of clay ready to pug in the morning and off I go. Hopefully I will get a mess of pots made. 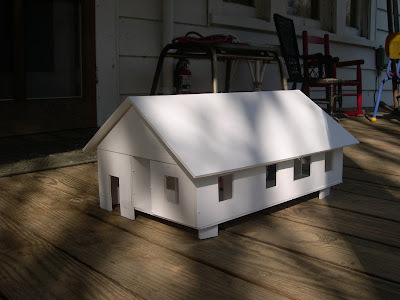 I'm going to the Benefit Auction for the NC Pottery Center next Saturday. Maybe I will see some of you there? Have a great week. I made a little stop by the School yesterday afternoon and visited with old Penland friends Ronan, Kara, and Nolan. It was the first time that Nolan and I have met although I have been reading about his triumphant and courageous life so far. Here are the guys with a new little swirl mug. 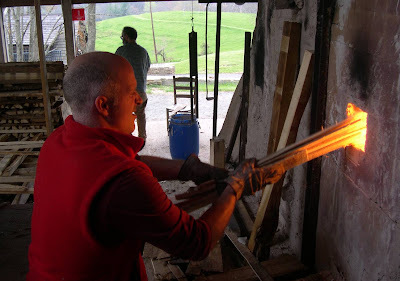 Meanwhile Michael Hunt and crew were stoking the wood kiln, things were going pretty smoothly and with really nice flamage (that's french for flames). Also on the crew were Michael's coinstructor Naomi Dalglish, super tech support from Maya Machin, and fellow super stokers Kim, and James. The kiln was almost dagh (that's french for done). I ran into John Tilton and Tom Turner at the diner in Mars Hill. John was up learning a thing or two from Tom. It was great to meet him because I've been admiring his work for a long time. ...and John is a regular Sawdust & Dirt reader! Unfortunately I was just passing through town en route to pick up my girls, and couldn't stay long, but I thought I'd snap this picture while we we all together. Happy travels John, come back to NC soon! 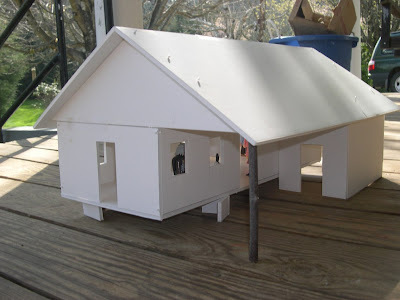 Here are a few shots from the model. Since I'm getting antsy for it to be done, I put some of the girls toys to work as models. They were surprisingly accurate and to scale! Here is a shot through the roof into the studio. Here is a picture through the showroom into the studio. 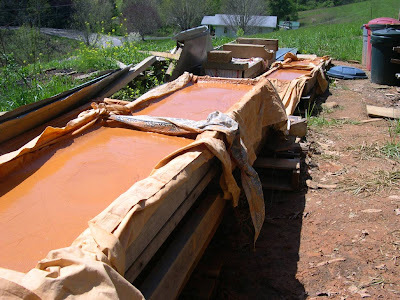 Rob Cartelli, a potter and student in the class at Penland this Spring has documented a trip to the mine in Cranberry, NC in search of the rare Ferrous Ferric Oxide. Check it out. holding a bowl with the mysterious Nuka glaze, "oh so dark, so mysterious." Naomi was working on a sculpture of some beast. 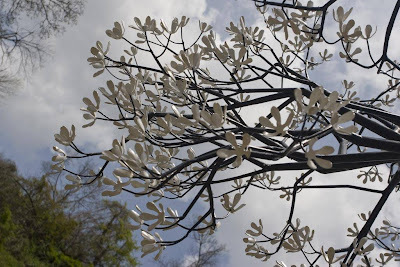 and then fumbled around with and ending up with a surprising resemblence to some kind of plant form. This potter is brilliant. Could it be Josh Copus? [correction: the brilliant potter is Maya Machin!!! ]I didn't find out. Maybe, although the forms are a bit different than I've seen him make. Seems I'll have to get back over there sometime next week for the unloading. was unloading an electric kiln with some of her work. On the right is a nice little drawing in clay. Would of been nice in the "Color and Line" show that I visited (and mentioned the other day) last week at Mudfire. Well it's always fun to sneak around Penland and visit. 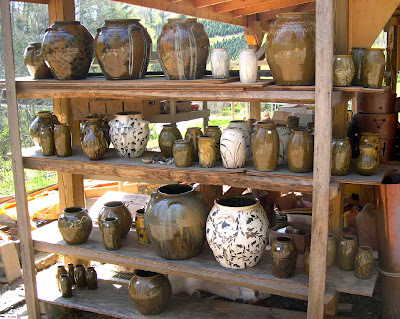 When I begin the juggernaut of pottery making next week I won't have the liberty of ramblin' 'round Penland. So I've got to get over there when I can.